SaaS engineering is a challenge at the best of times. What happens when things start ballooning out of control, say, when several users can edit the same file at the same time? Read on for one story of how such an issue was overcome. As any SaaS engineer can tell you, things that are simple in a single user scenario can easily balloon out of control when many users need to be accounted for. 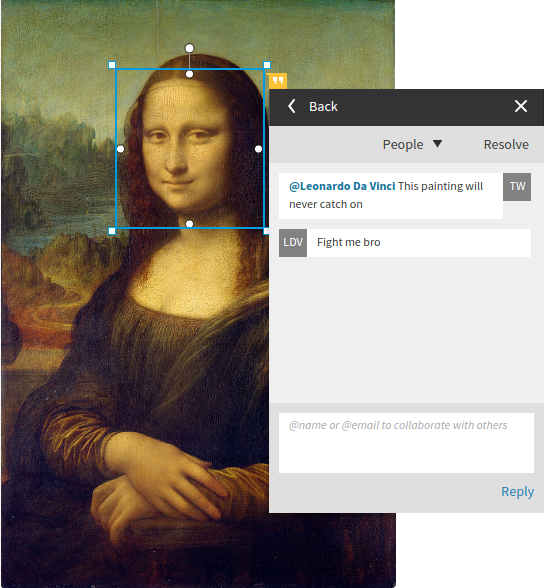 Take the simplest use case imaginable: editing a file. In a single-user scenario, it’s easy as pie. Read the bits, change some bits, write the bits. Done. When you introduce a few more users that can edit the same file at the same time, things get trickier—and before long, you’ve written some subset of git. Now add in the stipulation that users need to be able to access their files from any machine, and you need to highlight not-yet-viewed file changes. Suddenly you’re looking at an O(nm) storage problem: each file has to store n chunks of information about m users. We ran into this problem while revamping the commenting and notifications features in Lucidchart. Curious to know how we tackled it? Read on for details. Lucidchart is a cloud-based collaborative diagramming application, so features that enable our users to collaborate effectively are a must. We’ve had a commenting system in place for some time, but it has been plagued by pain points like users having to manually check each document for new comments instead of being automatically notified. Our goal was to alleviate those kinds of problems with the commenting system by building an extensible notification system, which would initially focus on notifications about unread comments. It turns out that doing this is not trivial. Let’s imagine that all users are connected at all times. Whenever a user submits a new comment, we push a notification to all collaborating users about that new comment, and let’s further assume that every user clicks the notification and reads the comment immediately. In this perfect world, the server can take a fire-and-forget approach to notifications, and we don’t need to store any extra notification data on the server. Obviously, this is not the case in the real world. Back in reality, users log in and out at their leisure, and even if we send them a notification, they don’t necessarily read it immediately. Instead, we have to store data about it for each user until they do read it. The O(nm) problem has begun to appear: we have to store a “seen/unseen” flag for each of n new comments, for each of m collaborators. This means that unless we find a cheat of some kind, we’re stuck with a bad space complexity requirement. Outside of the document itself, we have two other places we can store the notification data: in another table in a server-side database or in the browser’s local storage. Local storage is always alluring because it’s easy to use and it’s free, but it has the unfortunate drawback of being device-specific: if you read a bunch of comments on your work computer, your personal laptop won’t know anything about that and will display those comments as if they’ve never been read. With this in mind, we went with the database option, but we also used local storage to get the best of both worlds. The first constraint is straightforward: we don’t want to store anything unnecessarily. As for the second, our preference to rely on real-time notifications comes from the fact that we get real-time notifications basically for free just by having real-time commenting (which already existed), and we want to give users their notifications as early as possible. For failure modes, we reasoned that in the (hopefully rare) case where we have a notification hiccup, users would usually prefer to see a notification twice than to miss a notification. You may recall that the storage cost of notification data is O(nm), no matter where we put it. There isn’t a whole lot we can do about that; it’s pretty straightforward that we have m agents and n pieces of information to store about each agent, but in this case (and most likely yours, if you’re writing a comment notification system) we can make use of a convenient property of the information we need to store: one of its two states is a “black hole” state (meaning it can’t be left once it has been entered). Although a comment can be in an unread state, you can’t un-read a comment once you’ve read it, any more than you can un-see the Mona Lisa once you’ve seen it. Since we don’t have to worry about a comment ever becoming unread after it is read, we can just delete any notifications for comments from the server once they’ve been read. On top of that, we can mark a comment as read as often as we want without worrying about unintended side effects, which means a MarkAsRead method is effectively idempotent: telling the server 100 times that comment 5QB6 has been read is exactly the same as telling the server once that comment 5QB6 has been read. We can take advantage of this by adding to our local storage the IDs of comments that have changed from unread to read, and then attempting to delete them from the server. If we get an acknowledgement, then we delete them from local storage. If we don’t get an acknowledgement, then we leave the comment IDs in local storage and attempt to notify the server again each time we load the document. On the client, we request a list of unread comments each time the document loads, but only mark comments as unread if they are both in the GET response, and not marked as read in local storage. 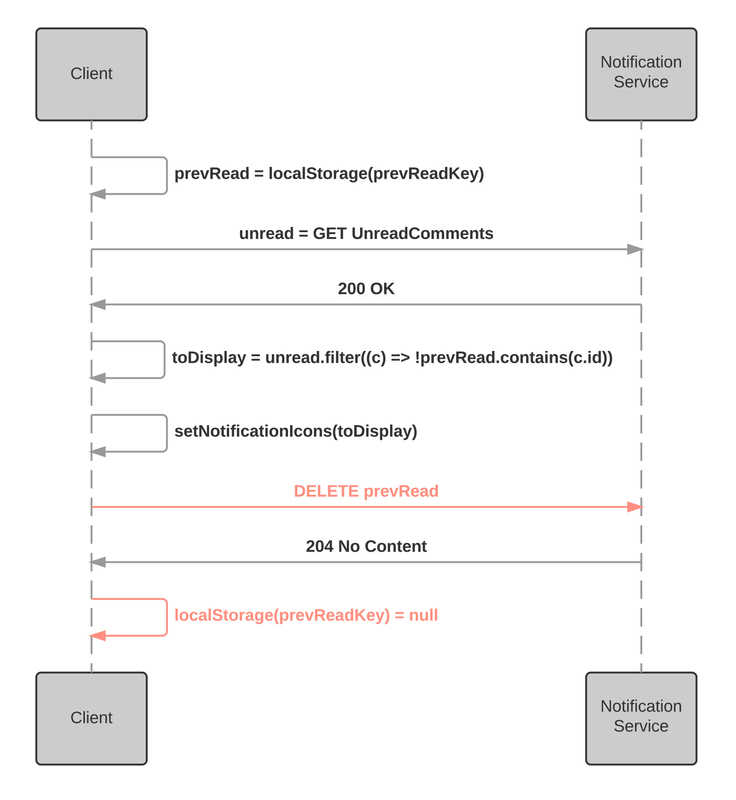 The result is that the server only stores notifications for comments it thinks the client hasn’t read, and the client only stores notifications it thinks the server needs to delete. You may be wondering at this point where constraint #3 (“In the case of failure, err on the side of marking comments as unread”) comes into play. There may be cases where the delete attempt of a read comment notification fails, which means that only the local storage of the machine on which it was read knows that it has been read. While it will keep attempting to tell the server that the comment has been read, the user may open the document on another device before it successfully does so. Notification data is user-specific. This allows us to store it outside the document, since no other user’s data (and, by extension, document data) will depend on it. Notification data is Boolean and has a black-hole state. This allows us to delete entries instead of storing false values. Both GET and DELETE are idempotent. This means that although we can never guarantee that the server and client have identical information, the client can send requests with impunity, without worrying about side effects. We can reduce the storage requirement even further by adopting a policy of not showing notifications older than x days, which effectively reduces the n in O(nm). In closing, when attacking a problem with known undesirable space complexity, keep in mind that while you can’t make the worst case outdo what the math says, you can make the common case small. Check out notifications in Lucidchart. Published at DZone with permission of Brian Pugh , DZone MVB. See the original article here.